Many people, when they think of working out, picture running shoes, treadmills, barbells and weight rooms with specific dedicated exercises. The truth is, though, that many chores and tasks that you need to do every day can provide an excellent full-body workout. For example, the simple yet difficult act of chopping wood can improve your cardiovascular endurance and improve your strength. 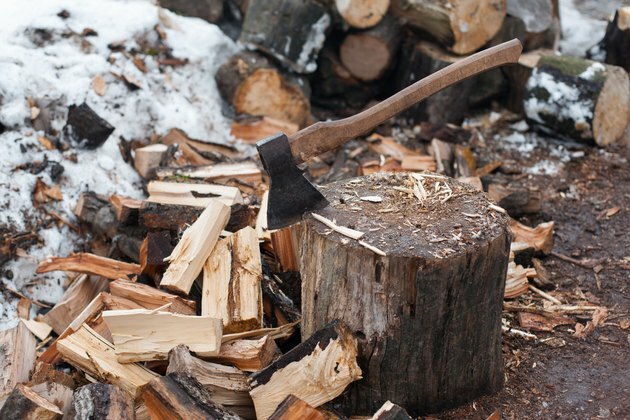 Wood splitting and other functional exercises provide an efficient workout that also help you accomplish the things you need to get done around your home. The form used to split wood is a full-body swinging chop that sweeps from the side of your body, over your head and down in front of you to strike a wood block on a stump. Your feet should be placed just a bit wider than your shoulders for balance. Use a tight, two-handed grip on the ax, and hold the ax near the bottom of the handle. Twist at the waist as you raise the ax from your side and bring it upward over your head. Straighten your arms and keep them locked. Rotate at the shoulders. As you bring the ax down, strike the blade down the center of the wood block. The act of a standard wood chop utilizes many of the major muscle groups in the body. The swing begins as you drive your legs into the ground, which activates the hamstrings, calves, quadriceps and gluteal muscles. The power required for the swing is also generated in the latissimus dorsi, the lower and middle trapezius, the deltoids, obliques and the pectorals. The activity also targets a variety of smaller muscle groups to stabilize you as you complete the swing. Splitting wood is also a low-intensity workout that can improve cardiovascular endurance when you perform it steadily for long stretches at a time. Constant repetition of swings using precise form will raise your heart rate, burn calories and improve circulation. In addition, the fluid motion doesn’t adversely affect your joints because the exercise is essentially non-weight bearing. Splitting wood several times a week will also help you develop aerobic fitness, allowing you to efficiently take in oxygen while you perform physical activity. With the use of any sharp cutting tool like a wood-chopping ax, special care must be taken to avoid serious accidents and injury. Keep all body parts away from the downswing of the ax. Be especially careful to keep your feet and legs planted and out of the way. Position the wood directly on the chopping block, and make sure no part of the wood hangs over any edge of the block. Use a sharp ax. How Many Calories Do You Burn Doing Yardwork?